Excellent with low impedence phones... like Grados, or Denons. Terrible with high impedence phones... like Sennheisers. Requires a pre-amp / line stage between source and amp to achieve good sound... unless you have a source with very high gain signal, which is rare. Forget any biased reviews below. Trust me... the MF X-CAN v3 is a superb headphone amp with all headphones... especially if you "replace the caps with Panasonic Caps, and the diodes with Tantalum Ultrafast diodes, and the tubes with some great Russian 6H23N-EVs, ro 6N1P-EVs. Very few heaphone amps can equal it... if any. But... whatever you do... DO NOT... get the X-CAN v8 - it doesn't have the power to drive any set of headphones properly without hiss / noise... unless you use a pre-amp / line stage to boost the signal prior to the amp. MF X-CAN v8 - avoid this one. warm and lush sound (with replaced tubes). Bass, dynamics, speed, low level details.
. After using it 1 month, i replaced the very cheap stock tubes with Amperex Bugle Boy. A whole world of difference. The amp's warm and lush sound gives me a lot of delight, but it is weak in the bass, speed and dynamics, and low level detail. I feel these weaknesses especially with my ultimatae headphones -Grado GS1000. These headphones need a much much better amp. In 450 $ it's not cheap, but if you open the box, you'll find a very cheap parts. I expect for more for my money - look for example at those Chinese companies, what they give you for that kind of money, and you'll understand my point. By the way. the name of the maker is Musical Fidelity. Well, let's say it is a Mid Fidelity product. Bass, Non-Etched Detail, Wonderful no matter what your favorite genre. Just a little more power. If you own HD 650's this is the headphone amp for you. I was wondering what the fuss was about the 650's compared to my Stax Headphones and amp. Now I know in spades, sweet, terrific bass, detailed but not fatiguing. It blows away the Headroom products I had been using (and the B&K S20's headphone jack). I now realize how much clipping and distortion was getting in the way of the music. The HD 650, MF combination is now my preferred for long listening sessions. 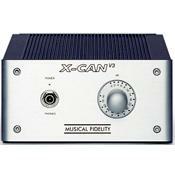 If you own HD 650,s or 600"s, you need to buy a Musical Fidelity X-Can V3. This is a truly great little product, simply perfect for powering good quality headphones. I totally believe that no matter what style of music you listen to, this amp can make it sound wonderful. I spend a decent amunt of time listening to my HD650's and they love this headphone amp. plenty of power, detail and depth to all music. it's hard to turn off at the end of the night. Compact in size, this amp is for anyone that loves detail and owns decent quality headphones. classical, rock, rap, industrial, it does it all with style. Bought this X-CanV3 off of a headphone forum used. Moved up from a Creek 11se. I'll make this short; in its stock form this amp is outstanding! responed well to the rolling of tubes with vass audio changes. I'd heard about folk upgrading the caps for an even better sound. So I tried it for myself. $45. worth of caps(all Panasonic FC) with the two output caps being Nichicon Muse Audio caps. It really improved the amp many fold! Bass got deeper, highs got sweeter, mids got more fluid and most of all the speed of the amp improved a bunch. This amp is really cheap in price when you weigh in the type of sound quality you'll recieve.A handfull of tubes can be used as a very high quality EQ. MF recomended I trye some 6n1p Russian tubes, I did and they sound Fantastic! Very pleased with this amp and my HD650 cans. Top notch! MF is one of the best. Outstanding value, rich, full, clear, clean sound. No outstanding coloration. I've used my X-CANV3 for 6month and I am completely in love with it. I listen to a wide variety of music and I'm satisfied with this. It powers my Sennheiser HD-650. Tha matching is best. I enjoy my headphone music life with V3 and Headroom cosmic reference module. These two are the end of my headphone music life. Transparent and powerful sound. Sweet and coherent. This headphone amplifier reminds closely the sound of Electrocompaniet amplifiers. It have a sweet and very delicate sound, but also powerful with excellent bass and highs. It matches perfectly Sennheiser HD 650, 600 or 580. One component that I see no need to upgrade. Midrange. No remote...don't mind with vinyl...upsets me more with CD. This is quite possibly the only Headphone amp you will need if you are listening for the sake of musical pleasure. I use Sennheiser HD650's, Grado 125's and Etymonic 4s headphones. For comparison (since this is the only way of categorizing me!) I have owned and or listened extensively with Headroom's Total Bithead (own...used for travel) and Audiolab 8000a (own...use for phono stage). Besides the aforementioned the majority of my listening is with Spendor S5e/Sub 3 speakers with Audiolab integrated (soon to be replaced). I'm writing due to the fact that there are too few reviews written here and hopefully I can add something to your search. My setup is the HD650's (Equinox cable coming soon) with Arcam CD73t and Rega P3 and Goldring 1006 (also to be replaced due to my new found love for vinyl) as sources. The MF is relatively small and very simple...one source in and a tape out. The volume knob works smooth and gives off an overall sense of quality. Power is rated at 1 watt which requires 1/4 to 3/8 turn for CD listening and 1/2 to 5/8 for phono. Let's get into perspective...for 399 (it's becoming available used for 250 to 300) we are dealing with Creek, Cmoy, perhaps Ray Samuel and a few niche brands. I'm assuming the next level would be Sugden's Headmaster, Grace Design's 901, McCormack and the like...needless to say I'm in the low range price bracket when it comes to amplifying my headphones (despite the fact that I listen for 2+ hours a night). The sound is fantastic!!! The sound is not extremely detailed but not limiting to the point of needing more. Bass extension is good with the Senn's and the highes are nicely rolled off...not super accurate as a more expensive amp might provide, but good enough to reveal more detail than any speaker I can afford. The midrange is where this amp lives...providing a smooth, effortless presentation that is neither fatiguing nor tiresome. Let's face it headphones are not about soundstage (unless compairing to other headphones) so the bottom line is whether or not you prefer a balanced, easily listenable presentation (ala MF) to what I would consider a detail oriented amp. This amp is all about enjoyment (mind you with more detail than my Spendor's supply...until I upgrade that darn Audiolab!?!). It has enough grip to present my music collection with fresh newness, however I could easily believe there is more to be had. But the midrange is so engaging that I can't help smiling from ear to ear. Good, Bad and down right Ugly recordings become listenable and enjoyable. At the end of the day (when most headphone listening occurs in my house) its the amp that lets me forget all the arguments around rolled off highs and bottom end authority. Instead I look forward to relaxing with whatever music fits my whim in the moment...cause I rely on the fact that the MF will deliver it in an enjoyable way! Build quality, dynamic, detailed sound, big image. The X-CAN is great into my high impedence HD600's with just an inexpensive JVC CD player (I haven't set up my CAL Audio CD player / DAC yet). Big, powerful, dynamic sound at half volume - it produces 1W of power. Bass is clear, well-defined, tight, punchy, and extended; mids are clear, well-defined, and farely warm; and the highs are clear, well-defined, bright, and not overly harsh. The image is fairly open, big, wide and deep - reflecting the environment of the recording (studio, club, auditorium, or whatever). Instruments and voices sound natural, with all the subtlties and nuances of the performances (i.e. breath / air, squeak of the fingers on the strings, details of the brushes, etc.). The overall impression is of an accurate, dynamic sound with impact, and very revealing of the recording and source details (whether bad, or good). The sound is not overly "warm" and "tubey" - probably more of a dynamic sound typical of solid state, but warmed, and rounded a bit by the tube output stage. Overall - great sound & great value.